16th over: Ashok Dinda is hitting the deck and hardly giving the batsmen any room to free their arms. Till now there isn't any help for the bowlers from the pitch. Dhoni has to attack more to force the openers to make a mistake. Pakistan are 83 for no loss. 17th over: R Ashwin goes for 11 runs from his first over of the match as both the openers near their respective half centuries. Hafeez and Jamshed reach their respective half centuries. 19th over: Runs coming thick and fast for Pakistan. In this over Irfan Pathan goes for 13 runs and India are looking for their first breakthrough. 23rd over: India now need a spark from someone, either bowling or fielding to get the first breakthrough. So far India have used eight bowlers and without success. Pakistan are 137 for no loss. Sachin Tendulkar comes in to bowl and that to off-spinners. 25th over: Pakistan are now easily picking up the singles and the odd boundaries with ease going at a run-rate over six. Pakistan are 150 for no loss. 26th over: Catch dropped. Tendulkar gives the ball a bit of air and Jamshed plays back to his right, but just didn't stick and looks to have done some damage. Now Raina will bowl the remaining two balls of the over. 30th over: Hafeez and Jamshed now approach their respective centuries. Batting so far for Pakistan has been risk-free. Pakistan are 184 for no loss. 33rd over: Hafeez drives straight to long-off and gets his century. Pakistan reach 200 in this over and might accelerate in the remaining overs. 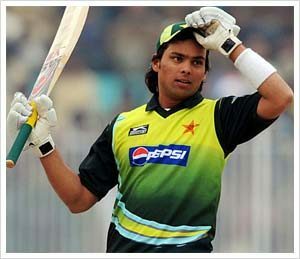 35th over: Jamshed pushes one to long-on and gets his first ODI century. He is a excited man now.